Florence Welch arrived at Harrods to perform for a crowd of fans gathered at the opening of Harrods Winter Sale in London on December 27th, 2011. Bieber posted this instagram photo to his twitter account and added, "spending time with family – feels really good. going to get to see these smiles on Christmas" on December 24th, 2011. This is a holiday photo sent to Rolling Stone from the husband-and-wife duo Tennis. Thank you Alaina and Patrick, and Happy Holidays to you, too! Wilco frontman Jeff Tweedy appeared on Chicago&apos;s WGN-TV Morning News December 15th to do the weather report. He shows up 32 seconds into this video and says in very non-descript terms that the forecast "could be worse." Wilco is in their home city of Chicago for a five-night run of shows to close out their 2011 tour. Sharon Osbourne fulfills a lifelong dream of transforming into Mary Poppins on Broadway for a segment on the CBS network show "The Talk" on December 13th, 2011 in New York. 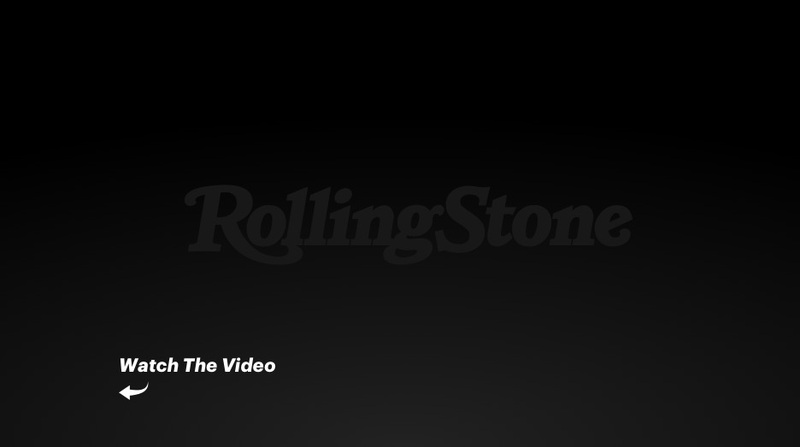 Top 10 DJ Paul Van Dyk walks down the cover hallway during a recent visit to Rolling Stone. While on his stroll, he pointed out that the photo of Pete Townshend on the cover of the December 9th, 1971 issue looks quite a bit like French DJ David Guetta. Freelance Whales play at RSFest which took place at Park Here, a pop up indoor park and open space gallery on Monday, December 12, 2011. Mary J. Blige took part in "WWE Tribute to the Troops," at the Crown Coliseum near Fort Bragg in Fayetteville, North Carolina. It&apos;s WWE&apos;s 9th year in honoring our troops for the Holidays. The concert took place on Sunday, December 11th, 2011. Nickelback took part in "WWE Tribute to the Troops," at the Crown Coliseum near Fort Bragg in Fayetteville, North Carolina. It&apos;s WWE&apos;s 9th year in honoring our troops for the Holidays. The concert took place on Sunday, December 11th, 2011. Conan O&apos;Brien, Jennifer Hudson, Victoria Justice and Justin Bieber join President Barack Obama and his family to sing the final song during the 30th annual Christmas in Washington gala on December 11th, 2011 in Washington, DC. Evanescence performs at the Nobel Peace Prize concert in Oslo, Norway on December 11th, 2011. The concert brought together artists from around the world to spread the message of peace and celebrate this year&apos;s Nobel Peace Prize laureates, Liberian President Ellen Johnson Sirleaf, Liberian activist Leymah Gbowee and Yemeni activist Tawakkol Karman. The concert was hosted by Helen Mirren and Rosario Dawson and also exhibited performances from Ellie Goulding, Sugarland and others. Lou Reed and James Hetfield of Metallica perform at day two of the bands&apos; 30th Anniversary shows at the Fillmore in San Francisco on December 7th, 2011. Kid Rock performs with Metallica at day two of the bands&apos; 30th Anniversary shows at the Fillmore on in San Francisco on December 7th, 2011. Shooter Jennings and Hank Williams Jr attend the Waylon Jennings Tribute with Hank Williams Jr, Jamey Johnson, Jessi Colter, Josh Thompson and Shooter Jennings on Outlaw Country at SiriusXm Studio in Nashville on December 6th, 2011. David Lynch signs copies of his CD "Crazy Clown Time" at Amoeba Music in Hollywood on December 6th, 2011. David Guetta becomes the first DJ and musical artist to be handprinted at the legendary Grauman&apos;s Chinese Theater in Hollywood. Guetta is also the first artist to be handprinted for the new musicians-only handprint series, Handprints Homage, in a ceremony that took place inside the newly opened Grauman&apos;s Ballroom on December 3rd, 2011. Pete Seeger is applauded as the special honoree at the Local 802 AFM 90th Anniversary Benefit Gala at Roseland Ballroom in New York on December 4th, 2011. RZA hangs out at the official launch party for The WeSC x RZA: Chambers by RZA in Los Angeles. The party was presented by RZA and hosted by Mike Epps. Live performances by Talib Kweli, DJ sets from Paul Banks of Interpol, WeActivists The Lady Tigra, Pase Rock and Eddie House of Steed Lord entertained the crowd throughout the night on December 1st, 2001. Indi songstress Lana Del Rey performed songs off her highly anticipated album Born to Die, scheduled to be released on Tuesday, January 31st, 2012 during an in-studio performance as part of SiriusXM&apos;s "SirusXMU" series. Lou Reed spoke to Occupy Wall Street Supporters at Lincoln Center in New York City. He stated to the crowds, "I want to occupy Wall Street. I support it in each and every way. I&apos;m proud to be part of this." His speech took place after the last performance of Philip Glass&apos;s Satyagraha on Thursday, December 1st, 2011. President Barack Obama greets Alicia Keys, Coca-Cola CEO Muhtar Kent and Bono after speaking at a World AIDS day event hosted by the ONE Campaign and (RED) at George Washington University in Washington, DC on December 1st, 2011. Mitch Winehouse, father of Amy Winehouse, poses for pictures with a dress worn by his late daughter on the cover of her album "Back to Black" at a photocall in London. The dress pulled in over £43,200 ($67,120) at Kerry Taylor Auctions in London Tuesday, November 29th, 2011. Deadmau5 performs a set celebrating the launch of the Nokia Lumia 800 smartphone at the Millbank Tower in London on November 28th, 2011. Mau5 performed exclusive remixes on a stage overlooking the River Thames while images were projected onto the side of the 120 metre high building. New York Times music critic Jon Pareles and Mary J. Blige speak during TimesTalks presents A Conversation with Mary J. Blige at TheTimesCenter in New York on November 28th, 2011. Blige just recently released an album, My Life II… The Journey Continues (Act 1). Justin Bieber performs on NBC&apos;s Today Show with special guest Usher in New York on November 23rd, 2011. Taylor Swift performs with James Taylor at Madison Square Garden during her Speak Now World Tour on November 22nd, 2011. Swift invited Taylor onstage to play "Fire and Rain" and "Fifteen". Musicians Kris Kristofferson, Darius Rucker and Lyle Lovett pose with First Lady Michelle Obama during "The History of Country Music: From Barn Dances to Pop Charts" event at the White House. Local school students had the opportunity to ask the legends questions about their music on November 21st, 2011. Justin Bieber guest hosts on SiriusXM Hits 1 in New York City. During the session he played songs he is thankful for this year including tracks by artists Beyonce, Chris Brown, Usher, Lil&apos; Wayne, Nicki Minaj, Rihanna, Drake and Selena Gomez on November 18th, 2011. Oprah Winfrey Network announces the premiere of Oprah’s new original primetime series Oprah’s Next Chapter which will feature Steven Tyler. The Joy Formidable appear with Blink 182&apos;s Mark Hoppus on the set of his television show, Hoppus on Music for an interview and performance at the Fuse Studios in New York on November 14th, 2011. A Christie&apos;s employee poses with a handwritten letter by Paul McCartney, dated August 12th 1960, inviting an unknown drummer to audition for The Beatles that is estimated to fetch around 7,000 British pounds (11,200 US dollars) during a press preview of rock and pop memorabilia at the auction house in London on November 11th, 2011. The letter was discovered folded-up inside a book in 2011 by an anonymous collector at a car boot sale in Bootle, Liverpool. A Christies employ poses with "Bed Peace," a placard by the late John Lennon, used during the historic Montreal Bed-In for Peace in 1969 and estimated to fetch between 80,000 and 100,000 British pounds (128,000 – 160,000 US dollars) during a press preview of rock and pop memorabilia at the auction house in London on November 11th, 2011. A Christies employ poses with a guitar played at Wembley in 1985 during a Live Aid performance by British rock guitarist Pete Townshend that is estimated to fetch between 10,000 and 15,000 British pounds (16000 – 24000 US dollars) during a press preview of rock and pop memorabilia at the auction house in London on November 11th, 2011. My Morning Jacket joins Paul Wesley, Nina Dobrev, and Joseph Morgan from the cast of Vampire Diaries on the set of the show. My Morning Jacket will perform on the show in an upcoming episode. A Justin Bieber look-a-like applies the finishing touches to MTV competition finalist, Sarah Burgoyne. She shows what she is willing to do for music by tattooing Justin Bieber lyrics on her thigh at the Good Time tattoo studio in East London on October 31st, 2011. Yoko Ono Lennon joins Hamish Dodds, right, President and CEO of Hard Rock International, and Bill Ayres, left, Executive Director and co-founder of WhyHunger, as they launch "Imagine There&apos;s No Hunger," a global campaign to raise awareness and funding for the fight against hunger and poverty, during an event at Hard Rock Cafe in New York&apos;s Times Square, Tuesday, Nov. 1, 2011. ?uestlove dons his LEGO heart pin as he poses with a completely exposed Heidi Klum during Klum&apos;s 12th Annual Halloween Party at the TAO Nightclub in Las Vegas, Nevada on October 29th, 2011. Debbie Harry performs at the first Beaux Arts Ball in forty years at Provincetown Town Hall on October 29th, 2011 in Provincetown, Massachusetts. Lulu is based on a series of plays by German dramatist Frank Wedekind, as interpreted by Robert Wilson. "Laurie Anderson and I sat going through it scene by scene to get the basic plot, the way Bob was approaching it," says Reed, describing his process before taking his lyrics to Metallica. Clarence "The Big Man" Clemons Honored by Big Stars at Little Kids Rock Charity Event. Little Kids Rock is a nonprofit provider of musical instruments and teacher trainings. A bevy of big stars came out to support Little Kids Rock including Lady Gaga, Maureen and Steven Van Zandt, the family of the late Clarence Clemons, Billy Squier and Matt White. The event raised enough money to provide music education to an additional 15,000 children. Little Steven Van Zandt interviews Green Day for the 500th episode of his radio show Little Steven&apos;s Underground Garage taped at the Hard Rock Cafe New York on October 21st, 2011. Jimmy Buffett was in Las Vegas for the Grand Opening of the Margaritaville Casino at the Flamingo, where the Guinness World Records certified "Lucky Rita," as the largest margarita ever made. In a container 31 feet tall, the colossal 8,500 gallon "Lucky Rita" will serve 181,333 margaritas through October 23rd. The first margaritas were personally served by Jimmy Buffett to members of the Wounded Warriors Amputee Softball Team, who will receive $5 from Margaritaville for every "Lucky Rita" gallon consumed through Sunday.